After servicing a call and addressing the customer needs, the actual call context becomes apparent. To compare the actual context with the predicted call context, a response strategy captures the outcomes of every call. The difference between actual and predicted outcomes determines the accuracy or predictive power of the model. The smaller the difference, the better the model is at predicting customer behavior. To gather responses, create a response strategy that captures outcomes. uPlusTelco wants to improve the experience of their customer support by predicting the reason for each customer call. 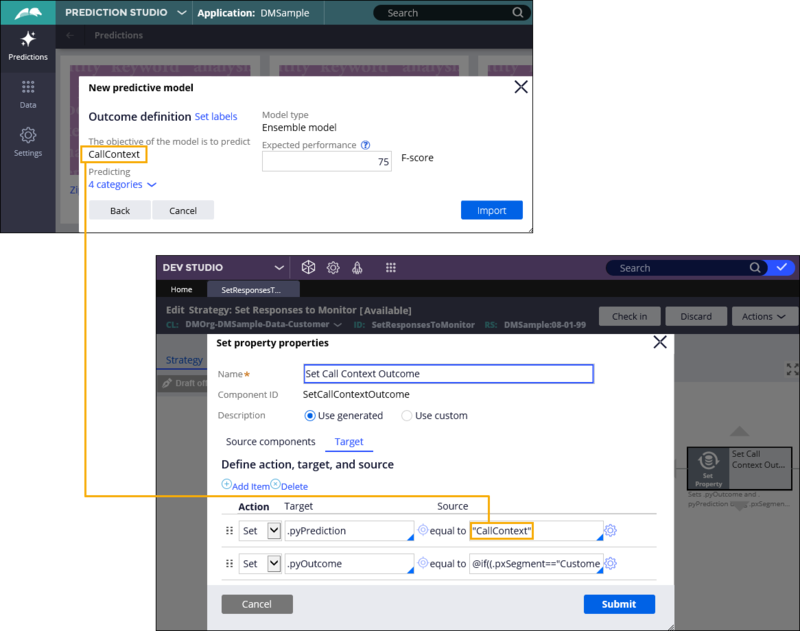 To achieve that goal, the data analytics team built a predictive model and uploaded it to Prediction Studio, while a system architect created a decision strategy with that model, and deployed that strategy in a decision data flow. Your role as a system architect is to create a response strategy that references the Predict Call Context model, to gather responses and monitor the predictive power of the model. Create a decision strategy for the predictive model. See Creating a decision strategy. On the strategy canvas, add the external input shape for ingesting data by right-clicking the canvas and selecting Enable external input. Add the Set property shape by right-clicking the canvas and selecting Enrichment > Set property. Connect the Set property shape to the External Input and the Results shape. Double-click the Set property shape. In the Define action, target, and source section, add a new action for setting the model objective by clicking Add item. Add a new action for setting the model outcome by clicking Add item. Verify the settings, and then click Submit. Reference your strategy in a response data flow to gather customer responses for analysis. The source data set with decision results that are collected in the decision data flow. The target data flow for analyzing the outcomes, based on their Interaction ID. After running this response data flow with your own strategy, the Analytics data flow runs the outcome analysis for predictive model monitoring. On the list of the Data Flow rule instances, locate and click SetResponsesToMonitorModels. Verify the initial settings and click Create and open. In the Mode field, select Capture response for previous decision by interaction ID. By turning this setting on, you configure the strategy to retrieve the adaptive inputs and strategy results for the interaction ID. 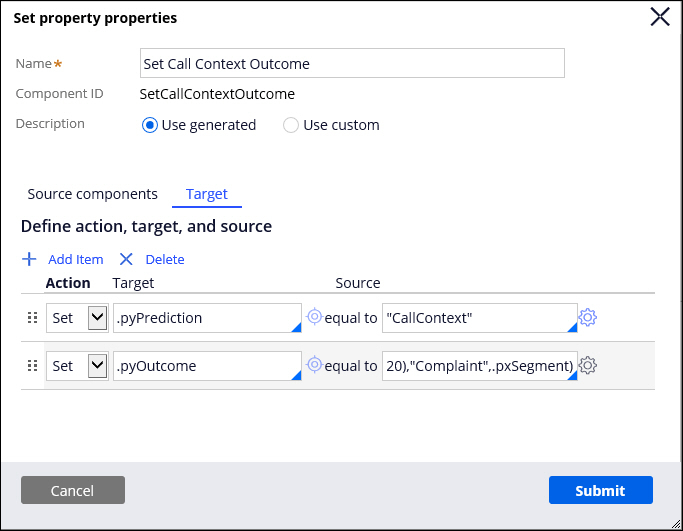 You have defined the objective and outcome of your Predict Call Context model and applied your strategy in a response data flow, which enables capturing responses to monitor the predictive performance of your model. Gather customer responses to produce statistics and analyze the response data by using varied predictive power metrics. See Monitoring predictive performance. For more information on response strategies, see Headless decisioning.